Tropical birds and botanicals thrive on this stunning accent scarf in opulent shades of turquoise, royal blue, bottle green, azure and violet. 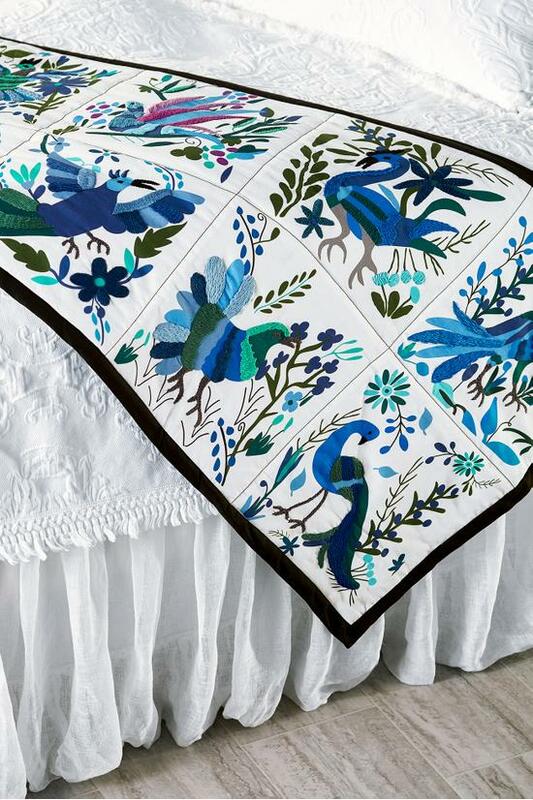 Inspired by an embroidered textile our founder, Robin, fell in love with in San Miguel de Allende, Mexico, this faithful reproduction is quilted on soft cotton and intricately hand-embroidered with a textural mix of stitches. A fabulous way to bring another layer of summery color and pattern to the bed. Poly fill. Machine wash cold, Gentle cycle, Only non-chlorine bleach when needed, Warmiron if needed, on reverse, May be dry cleaned.